Here are 7 ways to make your healthy salad recipes look so great you will definitely want to eat them! 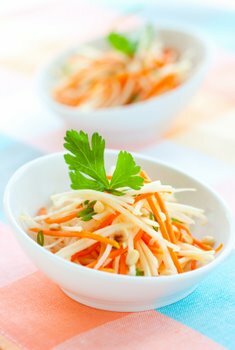 Follow these tips and your healthy salad recipes will look so enticing that you may just want to get your camera out for a photo shoot first. Looking through glossy recipe books you will see plenty of enticing photographs of artistically arranged salads. However, explicit tips that will help you achieve that look yourself are few and far between. So, apart from clever food photography, how do cookbook authors make their food look so good you want to eat the page? Often you will see photographs of vegetable salad recipes that have been built up in layers and presented at the table without being tossed. The dressing and tossing of the salad then happens at the table once your salad has been admired. Start with layers of the largest pieces, for example green leaves or chunky vegetable pieces. Continue layering using ingredients in order of gradually decreasing size. When you come to the last two layers, try to save a couple of ingredients that make a striking contrast. For example, top deeply ripened tomato cubes with the finely chopped green of chives. The sunshine yellow kernels of sweet corn make a bright contrast with the reds of capsicums, and grated carrot can be sprinkled on top of avocado slices. Given the diversity of colours available in salad fruits and vegetables, there is plenty of scope for using colour to sculpt your salad. You can chop all your ingredients into the same size pieces and mix them all together in a kaleidoscopic fusion. Or you can limit your palette to one or two colours. Make a totally green combination of lettuce, chives, avocado, cucumber and zucchini. Take strips of carrot and capsicum and radiate them around a centre of cubed tomatoes and sweet corn kernels. Ingredients such as snow peas and sunflower sprouts can be arranged vertically on top of your salad to draw the eye into the food. Fanned shapes made from capsicum or avocado and sprinkled with seeds or chopped herbs also look good. Some salads can be stacked for an interesting visual appeal. You can build your salad in a tall container (such as clean can) then carefully empty it upside down on your plate. Another easy trick is to create your salad in a wide drinking glass and serve it that way. The salad is then clearly visible and kept neatly inside the glass. Layered salads look particularly fine served inside a glass. Did you know the many common garden flowers are edible? And of course their gorgeous colours and shapes can add pizzazz to your healthy salad recipes. Flowers that are safe to eat include pansies, marigolds, nasturtiums, roses, borage, calendulas, jasmine, chrysanthemums and sunflowers. Once you have tossed your salad, you can gently mix the flowers through or arrange them on top as garnish. Another option is to pull apart the petals and combine them with your salad leaves as an extra ingredient. This works especially well with marigold petals, sprinkling highlights of bright orange and yellow throughout your salad. Be careful to avoid the flowers and leaves of azalea, crocus, daffodil, foxglove, oleander, rhododendron, jack-in-the-pulpit, lily of the valley and wisteria. “Plate it up!” If you’d asked me what that meant before the recent spate of cooking shows I would have had absolutely no idea, but now I know it’s an industry term for a simple concept. Plating is about making food look as appealing as possible on the plate. The selection of plate and arrangement of salad on it can make all the difference to the final presentation. Salads can be individually presented in smaller, stylish containers or artfully arranged on a large plate with an intriguing fringe of garnish. Dressings can be carefully dripped or drizzled into patterns that highlight your salad with panache. According to the experts, food always looks better on white, so choose white salad bowls and plates when you can. Leaving plenty of white space on the plate draws attention to the salad. A wonderful looking natural alternative to bowls and plates is to serve your salad scooped out into bowl shaped lettuce leaves. Whole leaves or flowers of any herbs you have included in your salad can make a pretty garnish, such as the purple fluff of chive flowers or the tiny delicate pinks of thyme. Sprigs of mint, lemon balm, oregano, basil and marjoram can be used to decorate your salad. For something different, try dipping lemon slices or onion rings in finely chopped herbs to make a grassy looking coating. If you want to get really serious about garnish, you can learn some simple vegetable carving techniques. For example, you can roll the spiral cut skin of tomatoes into pretty rose shapes, curl carrot or zucchini peelings around toothpicks and chill them in the fridge to make veggie ringlets and even sculpt mice out of radishes. The first step to better presentation is paying attention to how your food looks in the first place. Continue to notice and learn from the way experts arrange and present their salads and it will inspire your own attempts at home.